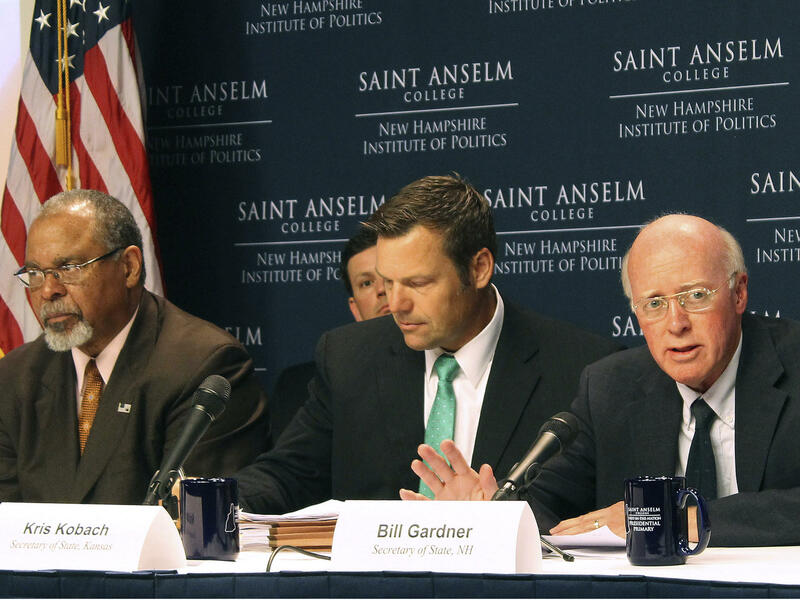 New Hampshire Secretary of State Bill Gardner (from right), Kansas Secretary of State Kris Kobach and former Ohio Secretary of State Ken Blackwell at the second meeting of the Presidential Advisory Commission on Election Integrity, on Tuesday. 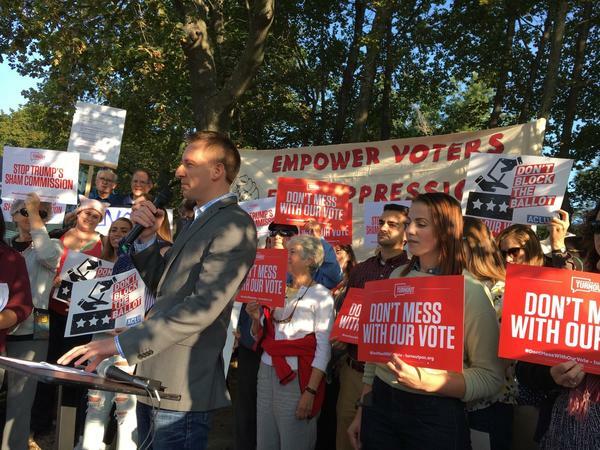 Protesters, including former Missouri Secretary of State Jason Kander, outside the election commission's hearing in Manchester, N.H., on Tuesday. They say the panel is stacked with members who believe that voter fraud is extensive and will use its conclusions to push for more restrictive voter laws. That did not sit well with another commission member, New Hampshire's longtime secretary of state, Democrat Bill Gardner, who happened to be the host of Tuesday's commission meeting. Gardner said Kobach's column caused a "problem" by questioning whether last year's election was "real and valid." "It is real and valid," he said, to the applause of some in the audience. But Gardner said he could see why there might be confusion. His state has complicated residency rules about who can and can't vote, which might lead some people to conclude that thousands of voters who use out-of-state driver's licenses as ID had committed voter fraud. Kobach acknowledged that the issue was "complicated" and said more research needed to be done. The incident illustrated one of the main problems the panel faces as it goes forward with its stated mission of finding ways to instill more public confidence in U.S. elections: The voting process is complicated and data are difficult to come by, a point several witnesses emphasized on Tuesday. Another problem for the commission's work is that it was created in response to President Trump's unproved claim that 3 million to 5 million people voted illegally in November. Democrats and many voting rights activists — about 50 of whom protested outside the meeting — have called the commission a "sham." They worry that the 12-member panel is stacked with members who believe that voter fraud is extensive and will use its conclusions to push for more restrictive voter laws. Kobach and the commission's chairman, Vice President Pence, have denied this, saying they have no preconceived ideas and will follow the facts where they lead. But the commission heard from several witnesses Tuesday that it's not always easy to find those facts, that voter data are limited and often incomplete, and that it's difficult to know what accounts for the drop in participation in U.S. elections since the 1960s. Some commission members have suggested people don't vote because they think the system is "rigged," but University of New Hampshire political scientist Andrew Smith said voter surveys by the U.S. Census Bureau have reached a different conclusion. "The major reason that they see that people don't vote ... is that they just didn't bother, they weren't interested, they forgot," Smith said. "Basically, issues of convenience and noninterest were the major reasons." Still, several members of the commission — including Kobach — have argued that voter fraud is a serious problem that undermines public confidence. The panel heard from several witnesses who have conducted studies that they say show numerous cases of people voting more than once, or noncitizens casting ballots illegally. "There's a high likelihood of voter fraud, based on what we've done so far with our analysis. There's likely a lot more to be found," said Ken Block, president of Simpatico Software Systems. His company studied voter data in 21 states and concluded "with high confidence" that there were more than 8,000 cases of people voting twice. However, Block's methodology has been challenged by numerous voting experts. One commission member, Maine Secretary of State Matthew Dunlap, questioned Block's findings, saying he has found that most problems can be explained by human error. "People tend to be law-abiding," he said. "What we've discovered, as we've done some of these exact same inquiries that you do, is that people check off the wrong box, they make a mistake, the clerk gets confused." Dunlap, as well as other commissioners, also questioned the viability of a proposal by another witness that voters undergo the same kind of background check now applied to gun buyers. John Lott, president of the Crime Prevention Research Center, said the National Instant Criminal Background Check System could be used to identify those who are ineligible to vote, such as felons and noncitizens. "The NICS system wasn't designed for elections," Dunlap said. President Trump's Election Integrity Commission went to New Hampshire yesterday to hear from witnesses about voter attitudes and voter fraud. The panel's stated mission is to find ways to boost confidence in the integrity of U.S. elections. Critics say it could do the opposite. NPR's Pam Fessler reports. PAM FESSLER, BYLINE: One thing commissioners did yesterday was try to clear the air. The panel's Republican co-chairman, Kansas Secretary of State Kris Kobach, recently wrote that New Hampshire had enough voter fraud last year to likely change the outcome of a Senate race. That claim didn't sit well with fellow commissioner, New Hampshire's Democratic secretary of state, Bill Gardner, who also happened to be host of Tuesday's meeting. Gardner said the problem was that Kobach had questioned whether his state's election was real and valid. KRIS KOBACH: We will never know the answer regarding legitimacy of that particular election. FESSLER: But witnesses told the panel that doing such research won't be easy, that voter data is limited. And it's hard to know why voters do or don't go to the polls. Some commissioners suggest it's because people don't trust the results, but University of New Hampshire political scientist Andrew Smith said the U.S. Census has found other reasons people don't vote. ANDREW SMITH: They just didn't bother. They weren't interested. They forgot. It was basically issues of convenience and noninterest were the major reasons. FESSLER: Still, the panel heard from other witnesses about studies they conducted that they said showed numerous cases of illegal voting. Ken Block is with Simpatico Software Systems, which reviewed voter data in 21 states. KEN BLOCK: There's a high likelihood of voter fraud based on what we've done so far with our analysis. There's likely a lot more to be found, and there's many different things to look at. FESSLER: But many election experts have challenged his results. And Commissioner Matthew Dunlap, the Democratic secretary of state of Maine, says he thinks the problems Block found are more likely the result of human error. MATTHEW DUNLAP: What we've discovered, as we've done some of these exact same inquiries that you do, is that people check off the wrong box. They make a mistake. The clerk gets confused. FESSLER: It's something the commission wants to explore more. Kobach has asked states to share detailed voter information with the panel so it can look for any evidence of fraud. A number of states have balked at that request, so it's unclear what, if anything, the commission can do. Pam Fessler, NPR News. Transcript provided by NPR, Copyright NPR.